Back in the sixties when airliner watching was a real down to earth pleasure. I use to listen for the high pitch sound of the Rolls Royce engines high in the sky coming from a United Airlines Caravelle flying along J-60 going into New York. It was always a pleasure to see the caravelle letting down over my home town. Airliner watching was a great hobby. Found this article in the 1957 edition of Flight Global. carried out a full range of strength tests on windows and other cut-outs and on sections of the fuselage itself. As soon as a complete fuselage and wings become available for this purpose, tank tests will also be made. For the tank itself, incidentally, the company is relying on what they term extensive British war-time experience in the making of prefabricated water tanks. This item, therefore, is not regarded as a major construction problem, and can be built easily enough when the ti!ne comes. The first prototype will not be furnished, but will naturally fly pressurized in due course. It will differ structurally from production aircraft mainly in having an escape chute in the cabin floor. The chute is arranged to pass through a hatch in the cabin floor immediately above the normal forward under-fuselage baggage hatch, so that its presence does not materially affect the fuselage structure. The other major variation is in the leading edge. At present a "droop-snoot" is fitted, but produc- tion aircraft will have permanently drooped leading-edges, and extensive research has been carried out to find the optimum droop angle. The team responsible for the Caravelle was, until some months ago, led by M. Pierre Satre, but he has suffered ill health and his duties have been taken over by M. Etienne Escola, head of the design department. M. Georges Favereau is in charge of production and the liaison between the two departments is assured by M. R. Douat. In charge of subsections are M. Paul Vallat, fuselage, M. de Lamaze, wings, M. J. Lepers, equipment, M. J. Frustie, installations, and M. Jean Muron, controls. The objective throughout the design of the Caravelle has been to produce a medium-range jet airliner capable of operating from existing air- fields in France and her African possessions, and in Europe in general. Particular care has been taken to make the Caravelle if anything less de- pendent on ground facilities than equivalent piston-engined aircraft. The internal batteries are designed for use in engine starting without outside assistance; and the passenger stairs, which can be lowered by hydraulic jack from under the tail, should contribute to easy access, while also acting as a stern prop. The Caravelle is intended as an alternative passenger, freight or mixed cargo aircraft, and to that end a large, hydraulically operated freight door is provided forward of the wing and to port. All systems have been designed to operate almost automatically, yet with full detailed control available in case of failure of any section. The fuselage is a stressed skin structure 103ft 4in long, including a cylindrical section of 51ft 8in with a diameter of 12ft 6in. The pressurized section measures 83ft 6in and has a volume of 6,003.8 cu ft. The passenger/freight cabin is 44ft 4in long, with a floor area of 430.5 sq ft and a maximum height of 6ft 8in. There are 28 windows, 11 of which are inward-opening escape hatches. Normal accommodation is for 70 passengers seated five abreast, but a high-density version could hold 91. There are two under- floor freight compartments, one measuring 21ft 4in by 2ft 3in, the other 18ft by 2ft; their combined capacity is 434.3 cu ft. In addition, there is baggage space forward of and behind the pas- senger cabin. Entry is by retractable stairway under the tail with an inward-opening door through the flat rear pressure-bulkhead, and freight can be loaded, without interfering with routine turn- round operations, through a freight hatch, measuring 6ft 6in by 5ft llin high, on the port side of the forward fuselage. A small sliding door is inset. There are 75 frames in the fuselage, of which 15 are reinforced. No. 7 marks the junction, immediately behind the windscreen, of the Comet nose-section with the S.E. fuselage. No. 13 picks up the nosewheel mounting and marks the forward edge of the freight door, whose rear edge is reinforced by frame 19. Nos. 31, 35 and 41 mark the wing/fuselage pick-up and Nos. 48, 51, 53 and 56 are frames braced by square-tube girders for engine and nacelle mountings. No. 60 is the flat cabin rear bulkhead, and Nos. 63, 65 and 69 pick up the spars of the fin. No. 73 marks the beginning of the tail-cone and holds the tunnel for the 22.4ft ribbon tail-braking parachute. The fuselage is built in three sections: nose, tail-cone, and cylindrical centre section. The nose is built on a vertical jig, from stringers pre-shaped on a rotatable plaster forme, and with pre- formed skin sections. For production aircraft, these will be stretch-formed. The fuselage centre section is built up of a number of smaller components assembled in the main fuselage jig. The actual engine-mountings depend from frames 53 and 56, from which bridge structures pass over the top of the engines to pick up the mounting points. This leaves the lower half of the engine cowling structure free of main supports, and the forward section hinges downwards on its outer edge to provide access for servicing. The rearward portion under the tail-pipe is detachable by means of quick releases. The rear pressure bulkhead is located level with the engine effluxes and consists of two diaphragms heavily reinforced with radial webs to the rectangular door frame. The forward face holds cabin pressure and the rear face is liberally perforated with flanged lightening holes. On this rear face are mounted the blue and green hydraulic reservoirs; and on the sloping tunnel, which accommodates the steps when retracted, are mounted the heat-exchangers with their rectangular ducts leading downwards from the fin-root intakes. The main rudder hinge (and the beam, on which the rudder Servodyne is supported) depends from rib 69, which is reinforced by a built-up web structure. At continuous level, the cabin floor is built up on transverse beams integral with each frame, supported by tube struts or, in areas of stress concentration, by square-tube girders. Two A.D.F. serial compartments are buried in the roof of the forward cylindrical fuselage section. the level of the tailplane as an integral part of the fuselage between the reinforced frames 63 and 69. Forward of this the dorsal fin is added. To the top of this structure the tailplane, built in one piece, is bolted and on top of this again is the main fin. It is a two-spar structure built up as a torsion-box of lattice ribs, three of which carry rudder hinge-brackets built out from the rear spar inside a simple shroud structure. The rudder itself is horn- balanced and the hinges are not inset. The tailplane has a span of 34ft 9in and an area of 301.4 sq ft. In order to achieve good control at high speeds, it has a greater sweep (30 deg at 25 per cent chord) than the wing and a smaller thickness /chord ratio. Like that of the fin, its aerofoil section is N.A.C.A. 65011. The elevator area is 69.42 sq ft. The tailplane structure is very similar to that of the wing, consisting of a pre-formed skin with span-wise stringers (here spot-welded), on which double-crescent-shaped ribs inboard and simple profile ribs outboard are assembled in a jig. The two halves, upper and lower, are then joined together to form the torsion-box. Forward of this, the detachable leading-edge section with its hot air ducts is added and the elevator hinges are built out on extended ribs and masked by simple reinforced-sheet, tube- braced shrouds. The elevator itself is a single spar structure with a modified form of crescent half-rib construction inboard and plain ribs outboard. A series of mass-balanced weights are cantilevered out from the elevator spar within the shroud hinge compartment. It is on top of the central carry-through section of the tailplane that the elevator Servodyne is mounted. performance in hot air proved somewhat conservative and, accord- ing to the latest figures from Rolls-Royce, the take-off weight graphs have been modified. The curves for the latest estimates are shown in the accompanying graphs. Cruising speed is estimated as 480 m.p.h. at 36,000ft and at a flying weight of 77,000 lb. In the light of modern design methods, the systems in an aircraft are of major importance. Especially is this so in the case of the Caravelle, whose controls are entirely hydraulically operated. TO get the Caravelle moving in order to taxi out it is necessary to use the two Rolls-Royce Avon RA.29s at about 60 per cent power; they are first opened up to 5,000 r.p.m., and the correct taxying speed can thereafter be maintained with about 4,500 r.p.m. 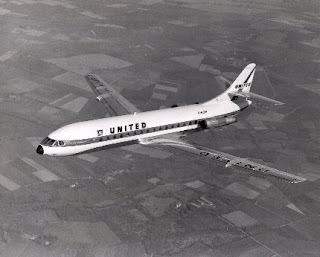 Directional control is by the steerable nosewheel, making use of brakes unnecessary; owing to the fact that the engines lie so close to the fuselage centre-line asymmetric power is not practicable for steering HERE is "Flight's" first report of the flying characteristics of the Sud Aviation Caravelle, France's increasingly favoured short-range jet air- liner—a class of aeroplane which is commanding the close attention of the British industry at the present time. The author, who regularly contributes Italian news to our pages, is also a free-lance test pilot. purposes. Rudder control becomes effective at 75 to 80 kt. Full take-off power—10,500 lb thrust at 8,160 r.p.m.—can be held on the brakes. For take-off the best flap setting is 10 deg. Allowable eg. travel is between 20 per cent and 35 per cent of the mean aerodynamic chord. With the Caravelle at a gross weight of 90,400 lb the nosewheel is brought off at about 7 kt below unsticking speed, which is 120 kt. Longitudinal stability, both during and after take-off, seemed good. Forward visibility I found to be beyond criticism, but on this prototype the outlook to each side—and especially to starboard—left something to be desired; improvements are promised in the production version. From "brakes off" the full-weight take-off run lasts approxi- mately 30 sec at an ambient temperature of about 20 deg C, and the undercarriage and flaps can be brought fully up some 20 sec after leaving the runway. Optimum climbing speed— 255 kt—is attained in 55 sec. The time taken to reach safety speed of 1.3 V8 hardly calls for consideration, as the Caravelle does not normally unstick until this speed has been passed. In accordance with American C.A.R.4b requirements, for take-off at an airport altitude of 3,280ft a gross-weight reduc- tion of 5,500 lb is necessary in order to achieve a take-off dis- tance comparable with the full-weight sea-level figure. An increase of 10 deg C in airport temperature implies a weight reduction of about 2,600 lb. To put the matter another way: for operations at maximum weight these airfield conditions require, respectively, a 9 per cent increase in take-off distance in the first case and a 490ft increase in the second. One increases optimum climbing speed progressively to 290 kt at 13,000ft, thereafter holding it at that figure up to cruising levels. Engine r.p.m. are held at 7,100 up to 30,000ft, then increased slightly (to 7,250) until the desired cruise alti- tude is attained. Initial rate of climb is about l,500ft/min (with a jet-pipe temperature of 580 deg C) and service ceiling is in the region of 42,000ft. Spiral stability is positive in both cruising and approach configurations. In approach and landing configuration the unaccelerated stalling speed at gross weight is about 90 kt, and one finds that a slight tendency to drop a wing can be easily counteracted by use of aileron. At all altitudes, and with any e.g. position, a slight reversal of stick forces occurs at approximately 100 kt. This is not caused by instability, but by airflow changes, and an automatic trimming device now counteracts it, so that the pilot is not aware of the effect. The trimmer is capable of cancelling-out stick forces at any e.g. position and airspeed. Trimming is accomplished by varying the datum position of the jack which applies artificial-feel loads to the control column. 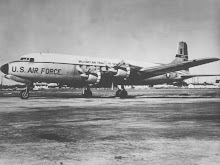 The control system [described in detail in Flight for May 27, 1955] is fully powered, with two independent hydraulic supplies; there is no means of reversion to manual control. Asymmetric power produces no yaw, because the thrust lines pass through the e.g., and no trimming is required to counteract yawing or rolling moments. By using the sensitive and effective trimmer it can be established that the Caravelle is longitudinally statically stable in all configurations and e.g. positions. A standard climb to 33,000ft covers 220 miles, takes 40 min and uses 4,400 lb of kerosine. Between 33,000 and 38,000ft, cruising speed at 7,250 r.p.m. settles at 390 kt with a fuel con- sumption of 4,400 lb/hr. At 32,000ft, cruising speed is 400 kt and fuel consumption 5,000 lb/hr. Maximum level speed at 20,000ft is 270 kt I.A.S. ; and in this condition dynamic stability remains good, even with acceleration from 1.5 to 2 g. Decreased temperatures at the higher altitudes cause a slight control friction, but effectiveness is not lost and the stick continues to return to neutral even after being sharply dis- placed. The layout of the air-conditioning and pressurization system was described in detail in Flight for May 27, 1955. In practice one finds that the indicators and controls are well positioned and the system as a whole effective. Sea-level cabin pressure can be held up to 18,000ft, which allows the maximum rate of descent of 5,800ft/min to be used without causing discomfort to the passengers. A standard demand- regulator oxygen system is fitted for the crew; and the "blinker" indicators are well placed for easy observation when necessary. Pressurization, air-conditioning, anti-icing and fuel system are controlled from panels distributed around the co-pilot's seat. The highest Mach number reached during my test was 0.84 at between 35,000 and 40,000ft. The only compressibility effect was a slight buffeting which began at a Mach number of 0.82; and there were no pitching tendencies other than those caused by the normal changes in static stability follow- ing increase in speed. Airbrakes, which may be used at maximum Mach number and I.A.S., extend in three seconds but cause a certain amount of vibration. Reduction of power is also an effective way of reducing speed. Aileron effective- ness is maintained at all speeds and Mach numbers. A typical let-down from 38,000ft to 5,000ft is made without airbrakes at a constant 216 kt in 36 min, covering 150 miles and using 660 lb of fuel. Standard reserves permit 45 min holding at 10,000ft, a missed approach and a diversion of 150 miles, using 6,600 1b of fuel. During the approach and landing one finds that flap and undercarriage extension cause negligible trim changes, and the airbrakes remain very effective. The normal approach is made with power at 1.5VSL (135 kt). Small power-variations produce only small results, but a strongish ground effect in calm conditions distinctly assists the pilot in rounding out. In power-off approaches or strong winds this effect dis- appears. From the 4,500 r.p.m. approach setting, full power can be reached in five seconds and acceleration is then suffi- cient to re-establish safety speed very rapidly. With the tail braking parachute the landing run can be limited to 1,800ft; without it, at a weight of 86,000 lb and in standard atmos- phere, the ground run is 2,160ft. At 66,000 lb the run is reduced by 650ft. [A full structural description of the Caravelle, with cutaway drawing, first appeared in Flight for May 20, 1955. I remember seeing them at O'Hare when I was a kid.